Shutdown Forces Nation's Radio Telescopes Into Inactivity : The Two-Way New Mexico's 27 dishes as well as a 100-meter antenna in West Virginia are among the National Science Foundation-funded telescopes that are being pointed upright into the "stow" position, preventing astronomers from continuing their work. The Very Large Array in Socorro, N.M. Many of the world's largest radio telescopes, operated by the National Radio Astronomy Observatory, are going inactive — the latest casualty of the government shutdown. NPR's Geoffrey Brumfiel reports that the NRAO, which is funded by the National Science Foundation and operates radio telescopes in West Virginia, New Mexico, Arizona and even Chile, will be pointing the giant dishes straight up, in the "stow" position. "We are ceasing observing, but we are not powering them down," Dave Finley, a spokesman for NRAO, tells Brumfiel. "We are preserving the cryogenically cooled environment for the receivers and basically doing everything we can to protect the operability of these instruments." 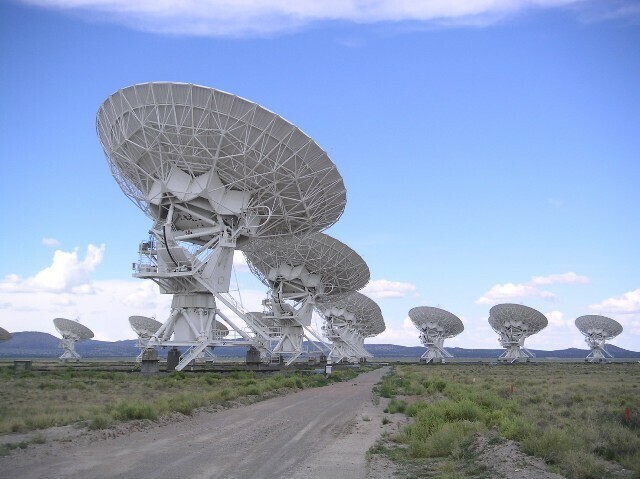 The instruments, which include 27 giant dishes at Socorro, N.M., known collectively as the Very Large Array, and the 100-meter Green Bank Telescope in West Virginia, are used by hundreds of astronomers each year to study everything from galaxy formation in the early universe to comets and planets in our own solar system. "The scientific community does not have access to these instruments while we are shut down," Finley says. "How many [astronomers] will be affected depends on how long the shutdown goes on."